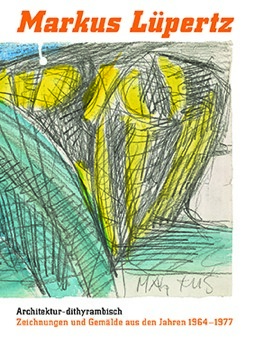 »The capriciousness, as well as the freedom, with which Markus Lüpertz approached this theme, but also painting and life in general, was something I found unique, and which expanded my state of consciousness, oriented as it was towards the Bauhaus and nurtured by Protestantism, to reach its greatest possible extent. This was the happy and logical progression of what had already changed for me in the studio of Hans Scharoun (...). Discovering these spaces, which for me were so new and spiritual, awakened me from a long, deep sleep. The right angle was replaced and the aesthetics changed,« writes Johannes Gachnang of his meeting with Markus Lüpertz in the late 1960s in Berlin, where the later curator and publisher had worked as an assistant to Scharoun. What today’s critics sometimes state vitriolically to be »anti-modern« behavior by Lüpertz was, in reality, a revelation for art in post-War Germany, as the material contained in this publication clearly shows. This applied especially since this attitude arose from a deep confrontation with the historic and utopian architecture that artists were already discussing and working on even following the First World War, such as Wenzel Hablik, but most notably Bruno Taut with his »Alpine Architecture«. From Lüpertz’ works we can see that since 1964 he has focused on the theme of the house, which he interprets as a house to live in, a studio, a family house, a settlement – all the way through to the idea of »Lüpiland«. The volume shows the formation of a pictorial language by Markus Lüpertz, which was subsequently to become a principle in his work, »namely the deliberate confrontation of opposites in the individual work,« as Siegfried Gohr writes in his excellent article.